Starting this January 2019, the Department of Education (DepEd) is scheduled to conduct the Early Registration for the incoming Kindergarten, Grades 1, 7 and 11 learners in all public schools nationwide. The Department of Education (DepEd) issues the enclosed Basic Education Enrollment Policy for School Year 2018-2019 and the subsequent school years thereafter, to institutionalize an efficient enrollment process in public and private schools, and state/local universities and colleges (SUCs/LUCs) offering basic education nationwide. Early registration of incoming Kindergarten, Grades 1, 7, and 11 learners in public schools shall be conducted from the last Saturday of January to the last Friday of February of each year. Incoming Grades 2-6, Grades 8-10 and Grade 12 are considered pre-registered. As for this School Year 2019-2020, January 26 marks the last Saturday of this month while the last Friday of next month falls on February 22. 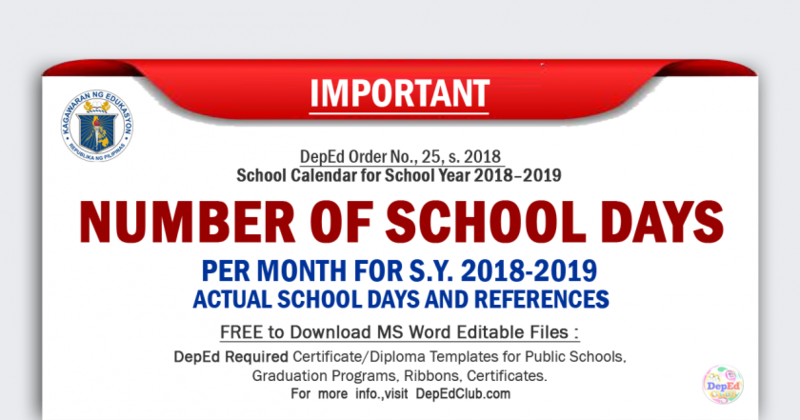 Therefore, the Early registration of incoming Kindergarten, Grades 1, 7, and 11 learners in public schools shall be from January 26, 2019 – February 22, 2019.
several policies, such as the adoption of the Learner Reference Number (DO 22, s. 2012), the Adoption of Modified School Forms (DO 4, s. 2014, the Omnibus Policy on Kindergarten (DO 47, s. 2016), and the policy on Transfer of Records (DO 54, s. 2016). This Policy is issued to consolidate the various issuances on enrollment and institutionalize a basic education enrollment process. All learners who elect to enroll in public schools nationwide must be accepted upon submission of the minimum documentary requirements articulated in this Policy. Learners who wish to enroll in private schools and state and local universities and colleges (SUCs/LUCs) offering basic education must submit the minimum documentary requirements stipulated in this Policy, and satisfy other conditions for admission that the institution may require. 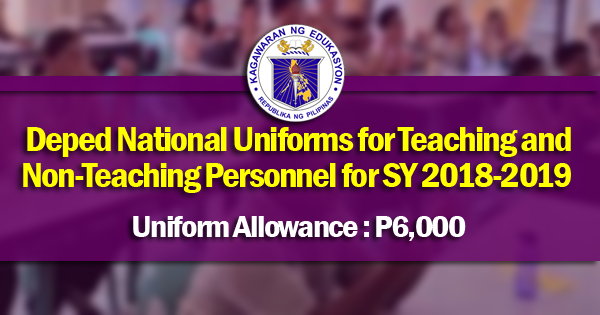 This Policy establishes the standard process of enrollment in public and private schools, SUCs/LUCs offering basic education, and Alternative Learning System (ALS) learning centers nationwide. This Policy shall guide DepEd offices and personnel involved in enrollment in public and private schools, SUCs/ LUCs offering basic education, and ALS learning centers. This will also provide guidance to parents and learners on the enrollment process and the attendant requirements. This Policy covers early registration, actual enrollment, Learner Information System (US) encoding, and reiteration of policies on collection of fees, among others. 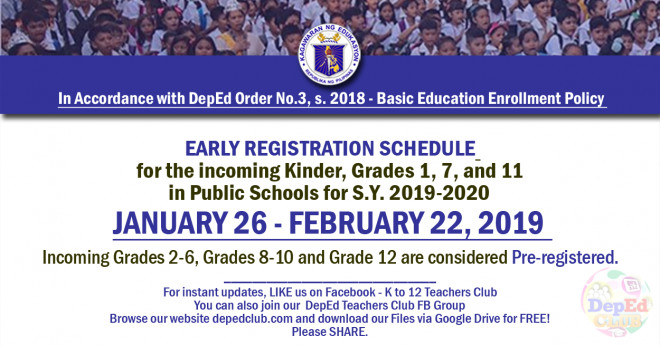 Early registration of incoming Kindergarten, Grades 1, 7, and 11 learners in public schools shall be conducted from the last Saturday of January to the last Friday of February of each year. Incoming Grades 2-6, Grades 8-10 and Grade 12 are considered pre-registered.